I’m one of those people that can’t sit still, always fidgeting and looking for a new outlet, and you can tell from looking at my project roster…in between the novel series, the two audio dramas, the t-shirt collaborations, the planners, writing here, oh and my entire freelance business, I definitely have my hands full. People ask me a lot about how I juggle all of these things, which is a pretty fair question (and, in case you haven’t guessed, the subject of today’s post!). Whether you’re as, uh, ambitious as I am about side projects or not, learning how to make containers for your time well will serve you as a freelancer. One of the biggest problems I see is freelancers giving everything they have to their client’s businesses, without leaving in the tank for their business. This is a huge contributor to feast or famine syndrome (since marketing is a big preventer of feast or famine). So, what do I mean by making containers for your time? Tuesdays, Wednesdays, and Thursdays are days devoted strictly to client work. Barring things like morning words or a quick writing sprint on one of my creative projects, I don’t work on anything those days except for client work. Mondays and Fridays are administrative and business development days, when I send emails, invoices, and do follow-up work. These days are also when I work on blog posts and my own creative projects. I also tend to do some breaking up of the tasks based on the time of day – more on that in this post. Separating my time like this lets me focus on the task at hand and tackle it in the most efficient way possible. There’s also less switching cost because I’m not bouncing around from client work one minute to writing a blog post for Bombchelle the next to working on an audio drama. The context of the tasks is similar, letting me move from one to the next with much less friction. The way I work isn’t a secret – I list it right out in the open on my freelance site. Sometimes, people think that clients must be irritated by the fact that I’m not available 24/7 to clients. The truth is, you can’t be, to run a successful business, especially if you’re just one person. Being available 24/7 is a sure path to freelancer burnout. Are there clients that are turned off by my work style? Probably. But if they want to be able to get ahold of me at a moment’s notice within office hours M-F, they’re probably not a good fit for my working style (and, in my experience, the clients that want that ability often have boundary issues in other ways, too). In reality, most clients really appreciate that I’m so up-front about how I work, understand that it lets me be more focused for them and keeps administrative or other work from distracting me from their work, and appreciate that I invoice on the same day every week. There’s also the side effect that, since I block out time this way, a client can wait to send me research or an outline until Monday and I’ll still be able to get the finished work back to them by Thursday of that week. I’m sure part of the warm reception my clients have to this system is that I always frame it as benefiting them. Which isn’t dishonest – it benefits them in a lot of ways (all of the above, plus me being able to produce work more regularly since I have a schedule, I’m not burning myself out, and I’m not stressed out about steady income). It just so happens that it’s also super beneficial to me. 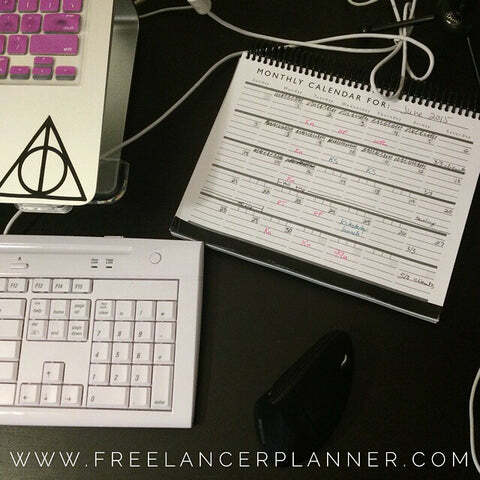 Freelancing isn’t just about doing client work – it’s also about staying on top of the admin and marketing work. You’re always going to have a lead time on projects (ranging from a week to a few months). But when you’re booked out for two or three months, it’s easy to forget that and let up on your marketing. If you haven’t been marketing, when you hit the end of those bookings, you’ll have to start from scratch – which means you’re looking at anywhere from a few weeks to a few months without income. No bueno. When things get busy, it’s easy to let my creative projects fall to the wayside. But with this container method, I have time already set aside for creative work, which makes it much easier to fit in. I’m a big believer in doing work that’s personally fulfilling, even if it doesn’t have a hard ROI. If you’re a coder, that work could be an app or game that you’re building. If you’re a writer, like me, it might be a novel or a podcast. Even though these projects might never make any substantial amount of money, they give me inspiration and energy that transfers over to my “normal” work. When I’m working on my creative projects, I’m a happier, more focused person the rest of the time…so it does wind up helping my client work, in its own way! All told, separating my time into these containers makes me more productive and fulfilled. Instead of being forced to multitask and jump between completely different tasks, I get to give focused attention to everything I do – letting my main business and my side projects thrive. Dear Michelle. Your writing is just inspirational. I have been following your newsletter and it jas led me to incredible insights and excelent content. Thanks for that. Do you have any tips on how to containeirize the days when you have a full time job? Im working on my side project but I just feel so overwhelmed sometimes. Any tips will be helpful! Thank you! Hi Ana! Thank you for the kind words! The most important thing with working with super-time-limited containers (like these, where you’re probably sneaking 30-60 minutes here and there, *maybe* two hours if you’re lucky) is to know what your priorities are so that when you have any time to work on it, you can immediately get down to it instead of trying to figure out what to work on. Once you decide when you’re going to work (and it might be like, two mornings a week and three lunches a week, it doesn’t have to be get up at 5 AM every day and work through lunch every day – don’t wear yourself out! ), my suggestion would be to create a list at the beginning of the week in order of priority and with time-estimates for each task so that when you can eke out a little time for your own projects you know exactly what you can get done in that time and you can just get started.